Malton's map is a square of 100 blocks by 100 blocks. When a player reaches the border of Malton, the player's in-game minimap will change in layout. 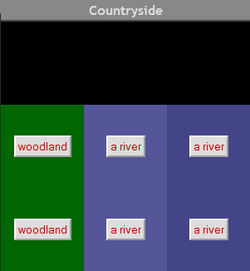 A player at the eastern or western border of Malton will see a minimap 3 rows tall but only 2 columns wide. Similarly, a player who reaches the northern or southern border of Malton will see their minimap remain 3 columns wide but shrink to 2 rows tall. 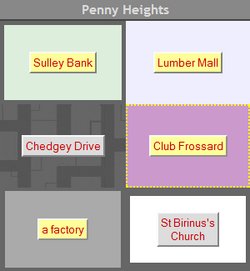 A player at any of the 4 corners of Malton will see their minimap shrink to 2 blocks x 2 blocks. You have reached the impassable edge of the quarantine zone, with layers of razorwire, low fencing and concrete-slab walls blocking your way. Player movement is similarly restricted at the walls of both of Malton's forts. However, unlike the black border squares of Monoeville and Borehamwood, players may ultimately reach squares across a forts walls by traversing through the fort's gatehouse. The river is too deep and strong to cross here. This page was last modified on 27 June 2012, at 05:54.